Last fall, we rolled out our first prospect rankings. In case you missed them at the time, you can see them here: 1-10, 11-20 and 21-30. Since that time, a number of other publications have released their rankings. While ours came out after the minor league championship games were played, the other lists have had the benefit of witnessing things like the Arizona Fall League and other winter baseball activities. Being a reflective individual, I thought it wise to revisit the Inside the ‘Zona rankings and cross-reference them with the lists from Baseball America, Baseball Prospectus and FanGraphs. First and foremost, here are the different lists. Please note that traded prospects like Matt Davidson and David Holmberg have been omitted. There’s a lot to digest here, so I think it’s best to divide this recap into a couple of different categories. We’ll look at the consensus picks, the discrepancies and some guys to watch closely as we evaluate the Diamondbacks’ minor league system. Below you’ll find a new list, which breaks down the system based upon consensus and listing position among all four top prospect rankings. This can serve as a sort of de-facto top 15 until we re-evaluate midseason. 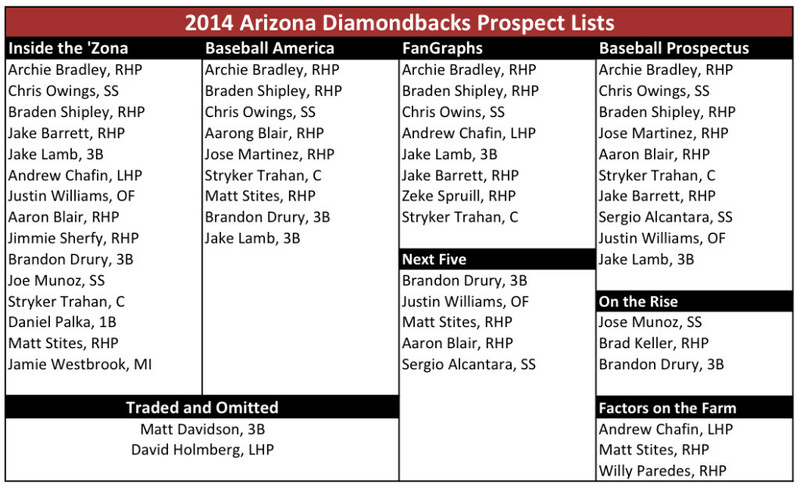 Archie Bradley, Braden Shipley, Chris Owings, Jake Lamb, Aaron Blair and Stryker Trahan appear on all of the lists. Of course, Bradley is the darling of the system and there’s no doubt among evaluators that he’s got a bright future ahead of him. Most see him as either an ace or a strong number two starter. Control has been his only issue, but that’s often the case with young power arms. He should see time in Phoenix at some point in 2014, possibly sooner rather than later. Braden Shipley was described by Jason Parks of Baseball Prospectus as a guy that is going to fly up prospect lists and could very well end up as a top 30 overall prospect once the 2014 season concludes. Similarly, he’s quite high on Chris Owings and thinks that he’s enough of a well-rounded player to be an above average big league regular. Owings’ plate discipline has given others pause, including myself, but I tend to defer to those who have scouted him heavily. Parks’ comments are quite the compliment for these two. Jake Lamb, Aaron Blair and Stryker Trahan are all top prospects, but the jury is out on just how valuable they end up being. Lamb has shown solid production in the minors despite lacking any true impact tools. Blair is likely an innings-eater, number four type of starter. There’s value in that, but he isn’t a guy to get overly excited about, at least at this point. Trahan is on every list, but that’s mostly due to his draft status in 2011. The production has been slow to develop and he loses a lot of value if he can’t stick behind the plate defensively. There are many out there who see an eventual move to left field in his future. Two relievers who are close to the majors appear on three lists, in Jake Barrett and Matt Stites. They profile as high-leverage relievers but out of the bullpen, their value is limited. That’s not to say that they aren’t important pieces, it’s just important to point out that a starting pitcher is much more valuable and that relievers are volatile commodities. Brandon Drury is climbing the ladder nicely after a fantastic 2013 campaign. He’s a long way off at moment, but the signs are encouraging as he is likely to hit for average and power while playing a solid third base. He could jump up lists with another strong showing in 2014. Jose Martinez is high on Bill Mitchell and Jason Parks’ lists but was left off of mine and Marc Hulet’s at FanGraphs. The reasoning here is that Mitchell and Parks are full-time scouts and have seen Martinez’ power arm in action while I have not. He has a big time fastball and some promising secondary stuff but is yet to really harness the arsenal. At just 19, the ceiling looks very high for Martinez but there’s a considerable risk with him, too. He walked nearly as many as he struck out in 2013 but was very young for his league in 2013. If he can find the zone, he will shoot up lists in the near future. Justin Williams and Sergio Alcantara are also youngsters with promising skill sets, but have a long way to go. They both flashed solid production in 2013. Scouts like Williams’ power potential as an outfielder but there are some legitimate concerns about his body and how he might physically develop. Alcantara can pick it at short and showed an advanced approach at the plate in 2013, but just how much he hits at higher levels is yet to be seen. These are guys to follow closely in 2014. Andrew Chafin still baffles scouts. He’s been a starter primarily but some see an eventual move to the bullpen for him, myself included. From the left side, he has a decent fastball and a strong slider but the changeup has been slow to develop and is really the key to his ability to stay in the rotation. I wonder how long Arizona waits on him as a starter before pushing him to the ‘pen where he could contribute as early as 2014 at the major league level. Joe (Jose) Munoz has some solid tools and was selected second round in 2012. There’s some power potential with him but his body profiles better as a third baseman long term. He’s a bit of a wait-and-see guy as he’s really yet to put together an impact minor league campaign. With that said, he’s fully capable of exploding in 2014. Jimmy Sherfy is a reliever with a funky delivery and an ability to miss bats. He could rise quickly and be in the bullpen in 2015. He’s yet to face advanced competition and his upcoming campaign will tell us a lot about future. As Parks and others have noted, there are some major upside talents in the low minors for Arizona. Jose Martinez definitely qualifies, as do Sergio Alcantara, Justin Williams and Joe (Jose) Munoz. Others like Brad Keller, Jamie Westbrook and Fernery Ozuna shouldn’t be overlooked. Michael Perez had a tough 2013 but may rebound next season, Venezuelan bonus baby Jose Herrera should make his minor league debut next summer and Andrew Velasquez will look to continue build his reputation as a solid middle infield prospect. Although every season is important, 2014 will help define just what type of talent the Diamondbacks have in the low minors. Hopefully a handful of these guys will break out and put themselves squarely on the map. It’s always good to hear scouts and writers get excited when talking about your prospects. Scouting Director Ray Montgomery has done a nice job of assembling upside talent in the system. If the Diamondbacks can hit on a couple of high-ceiling prospects, there will be even more reason to get excited about the future in Arizona. We’ll be keeping up with the minors all season long, so stay tuned for updates. Great stuff. I, like most people, love Archie Bradley. I think he has a real chance to become one of the best pitchers in the game, and I would not trade him for anyone (except maybe Mike Trout). I also really like Braden Shipley. His ceiling is really high considering that he has only been pitching for a couple of years. My favorite guy is Brandon Drury. He had an awesome age 20 season in South Bend, and I think that he could become one of our best prospects. He smashed 51 doubles, hit .302, and only made 13 errors at third base last year after coming over in the Upton trade. There are a couple players here that really concern me. I’ve already expressed my issues with Chris Owings so I won’t bore you any more than I have to. Jake Lamb needs one more good year to sell me. He was great last year in a hitter’s park at age 22 in Visalia, but struggled at third base with a fielding percentage of .901. If he can play a little better defense and keep hitting next year in Mobile, I will be very excited. Stryker Trahan does have the best name in baseball, but he didn’t hit as well as I would have liked him to last year. His .462 slugging is good, but a .254 average and strikeout rate of almost 25% need to improve. I say that we keep him behind the plate and let him try to figure it out. He threw out a tremendous 40% of base runners last year, but allowed 17 passed balls and committed 11 errors in 44 games (no, those are not typos). I’d give him one more year before moving him to the outfield. I think bullpen prospects are undervalued. Think about how good we would have been if we had Craig Kimbrel last year. The highest he was ever ranked by Baseball America was 86th. We have three potential closers in the minors right now and I would not trade any of them if I was Kevin Towers. Jake Barrett had a 0.36 ERA last year in Mobile at age 21. Matt Stites in his career has pitched 135.1 innings and boasts a 150-19 K-BB ratio. He also has a career 1.53 ERA and a 0.702 WHIP. But my favorite is Jimmie Sherfy. In his first season in pro ball, Jimmie amassed 29 strikeouts, 4 walks, and an ERA of 1.04 in 17.1 innings at Hillsboro and South Bend. We have a really good farm system even after all the trades that KT has made. We have lots of guys with serious upside and I would like to see us hold on to as many of them as we can. Pretty much agree with you on all counts, although I didn’t know that about Shipley. On the bullpen prospects issue, I absolutely could not agree with you more. And I absolutely love that the org seems to be moving in that direction with Stites. 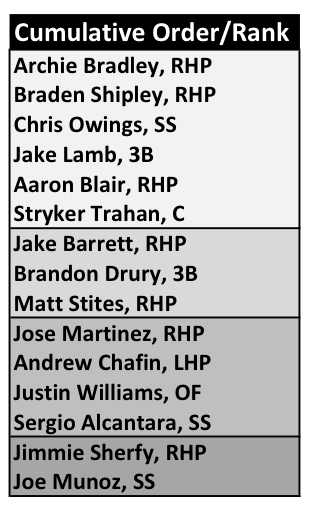 To he, Barrett and Sherfy, I’d add Chafin as well, and Anthony Meo still has a shot at being a big league reliever. Bradley is Bradley and we know what that’s all about. Shipley is the guy that I’m most excited for even though Bradley is the top dog. In a recent Baseball Prospectus chat, Jason Parks said that Shipley is the guy that other teams will be kicking themselves that they didn’t take. He was an absolute gift at #15. He has plus velocity and a plus changeup to go along with a developing curve. Mix him and Bradley, and there’s nasty 1-2 punch in the future with Patty C in the mix there, too. I like the sounds of that a lot. The position player side has me concerned. I’m uneasy about Owings and the rest of the impact on offense is a long ways away. Trahan hasn’t hit like he was projected to. Some say that’s because he trying to learn to catch, but I’m not sure if I buy that. Lamb has had another solid season but he’s not a star, more like an average regular. Drury is a guy that could turn heads. He’s young enough to still have a bunch of development left and he was awesome in 2013. He’s another guy without any standout tools, but might have a higher ceiling than Lamb. I’m curious to see if Drury can be productive again in 2014. He bombed after his big 2011 season, so stay tuned on that. The low minors (complex level) is where a lot of the high-ceiling talent is at. These guys are all at least three years away, though, and most are four or five years out. Williams has the most impact potential of any of the outfielders and there’s a bunch of infield prospects to like. There are some good arms down there, too. Ray Montgomery has built a lot of talent in the organization in the last two years, both through the draft and internationally. While these guys are a long way off, the talent level has been on the rise, and you gotta love that. I’m excited to see what they can add again in 2014.